★★★★★ This was better than expected once I got it connected correctly. 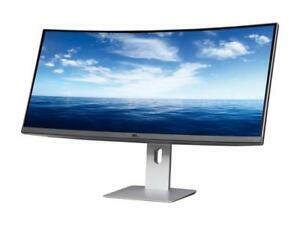 No one will be disappointed if this monitor is more than an upgrade over more generic displays. The real issue is the factory settings for hooking into computer as there three different input sources. I had to search the web as the quick guide does show you connecting it properly, but doesn't tell you the default input setting leaving you confused on why the monitor isn't working once connected. There may have been small print somewhere stating this, but as a plug n play user, seeing a sticker on the monitor pointing where to change the input setting would go along way for convenience. ★★★★★ I had been using a three monitor array for work (writing, video editing, etc) but decided that i would try this monitor. So far my impressions are positive. The picture is wonderful. the speakers are acceptable. The ability to divide the screen into segmented areas makes it easy to have multiple tasks open at the same time. The onscreen menu system is easy to use and very intuitive. I also greatly appreciate the ability to easily adjust the height and direction of the monitor (It swivels). There were some issues with set-up. i had to go online and find the software for the monitor in order to get it to work at its highest resolution. i also had to do an extensive search for the software which allows me to segment the screen but once i found it it installed and works well. I have not yet hooked up the usb ports but will do that soon. my only issue with this, which i knew when i bought it was that it only has one HDMI input. This makes it difficult to hook to a second computer and still have sound. That is my only issue. i would recommend this monitor and would buy it again. ★★★★★ Have two of these side by side as well as three 24" monitors above them. With my setup I can honestly state "what took me so long to do this?" The 34" curve is very slight, not like the large 65" I have at home but a very gentle curve only noticable from the side profile. But the width and clarity is perfect for everyday usage. I don't game but use MS Office, CorelDRAW, PhotoShop and numerous other programs all running simultaneously and these two monitors don't skip a beat. Lotsa room to "stick" apps in different corners or along 1/2 the screen and all crystal clear. The only flaw I see is when booting up my computer I notice the "bleed" along the corners, but once inside Windows 10 the monitors are flawless without any bleed whatsoever. One of the HDMI cables went bad and the screen looked terrible. Forutnately I have plenty of HDMI cables laying about so swapped out and back in business. I just ordered a 6x monitor mount to put these two 34" Dells on bottom and my other 3x 24" monitors above so they are off my desk and closer together. Delivery due today so looking forward to fine tuning my setup even further. I would highly recommend these monitors to anyone looking for room to work. ★★★★☆ Used it through HDMI with my 2012 Razer Blade Pro 17 Laptop and got the full resolution without any issues or special settings. Superb crisp image with stunning colors. Beautiful industrial design. Best stand ever. Yes, like all Dell monitors, there is some backlight bleeding but again at $600 it is to be expected. Apple monitors still have the highest build quality but if you use a PC, they are not really the best option. Excellent buy!